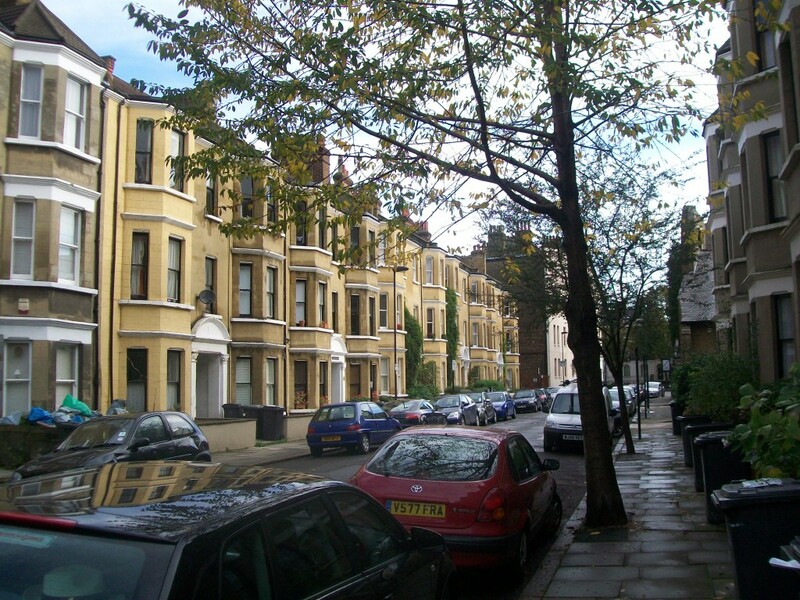 Mowll Street is a straight road that runs from Brixton Road to Hackford Road, it is almost entirely residential. Mowll Street was previously called Chapel Street and prior to the buildings we see today this site was occupied by earlier houses for which few records remain. 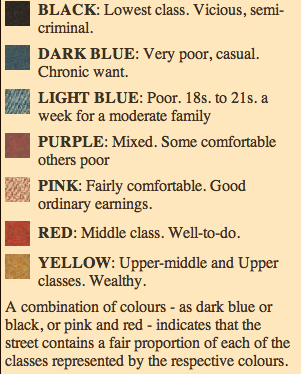 From looking at Charles Booth’s poverty map (further down on this page) the tenants of Chapel Street were poor. The street name was changed from Chapel Street to Mowll Street between 1936 and 1938. 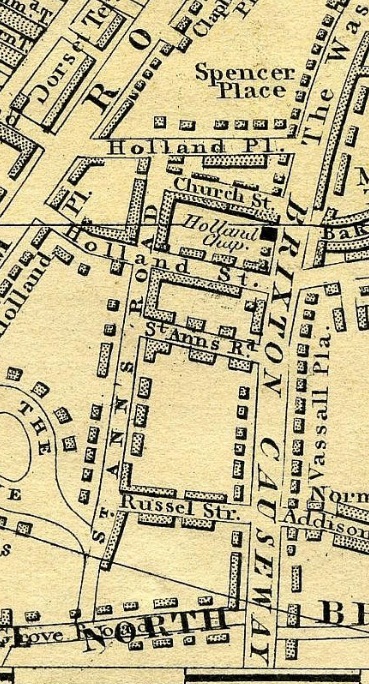 The name Mowll comes from William Rutley Mowll who was the Vicar that oversaw Christ Church (at the Brixton Road end of Mowll Street) being rebuilt. It is unclear exactly when Chapel Street was developed into the rows of mansion blocks that we see standing today. The properties appear to be late Victorian/early Edwardian. They are not quite as old as those of Handforth and Crewdson Roads. 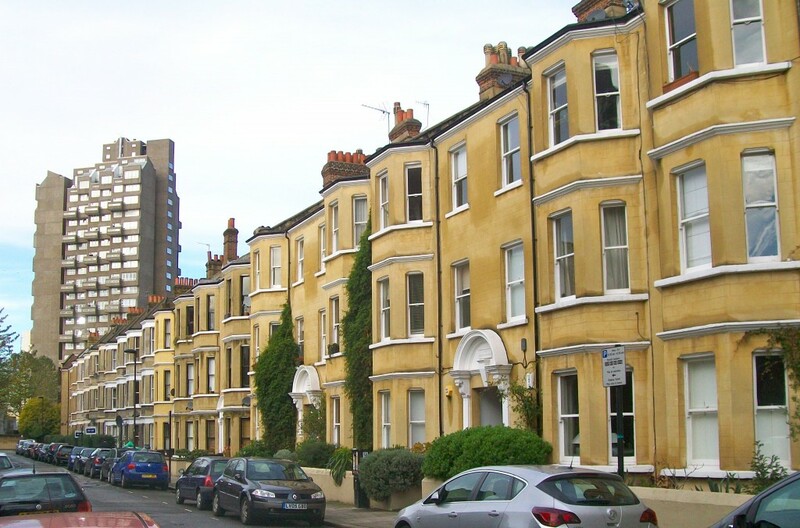 The appearance of the mansion blocks in Mowll Street is quite similar to those in nearby Cranworth Gardens which were built between 1899 and 1901. 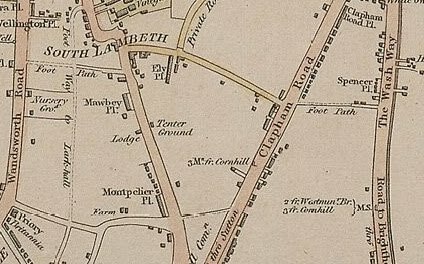 The above image is from a map produced in 1809 and is called ‘Laurie and Whittle’s New Map of London with its Environs, including the Recent Improvements’ This is the oldest map that I can find that shows the area that Mowll Street stands upon. Note that at the time Brixton Road was known as ‘The Washway’ due to the Effra flowing along one side of it. 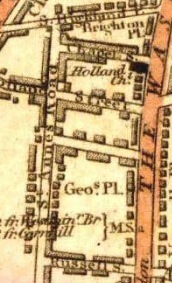 This area was predominantly rural at the time of this map, it is hard to believe that such an urban area was once considered idyllic however back then the sound of flowing water, the abundance of open space and the sound of birdsong would have been a welcome retreat from the City itself. Laurie’s Map of London 1844. 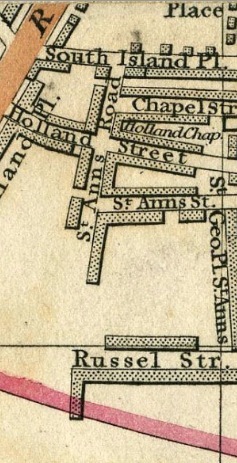 This is Cross’s New Plan of London 1861, the street should have been called Chapel Street, it appears to be mis-labelled. Looking at the street on this map Mowll Street appears to have quite a few houses on it. 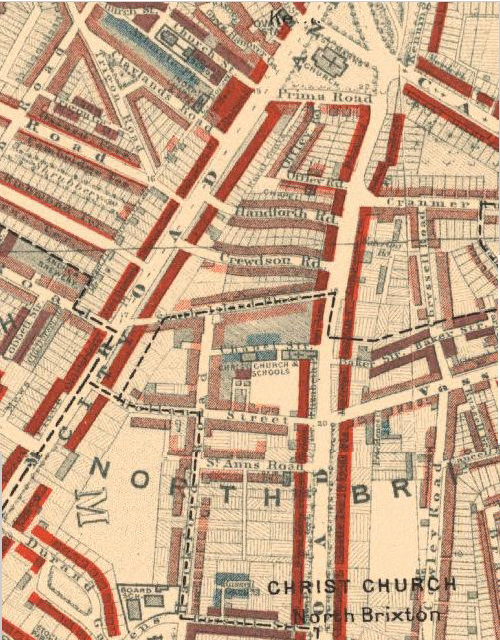 Charles Booth’s Map of London Poverty research took him to Chapel Street (Later renamed Mowll Street) in 1895. 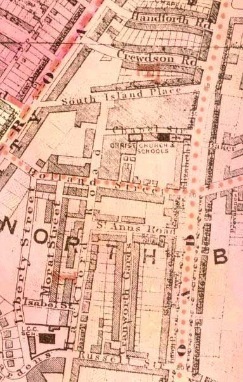 The Map above is from 1898 and shows how Booth graded Chapel Street in light blue which indicated ‘poor’. The key to what the colours mean can be seen to the right of the image. For more information on Charles Booth and the classification of poverty see here. It is one of only two streets within my project boundaries that were graded as ‘poor’ by Booth. This particular map is also interesting as it shows us exactly how many houses were on Chapel Street before it was developed into the rows of mansion flats we see today. 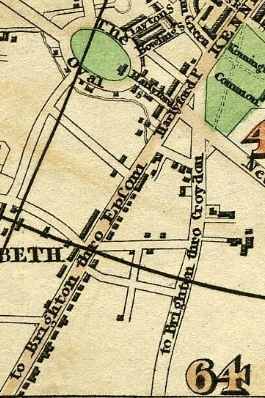 Chapel Street can be seen here on this 1918 Ward Map. It is remarkable to note how much the area has built up over the years, especially when scrolling up to the 1809 map when this entire space was empty. Mansion Blocks were first built when land in the few London locations acceptable to the wealthy was scarce, and demand for a pied-à-terre in the capital was high. Although the need to build upwards was obvious, investing in the early mansion blocks was risky because flats, no matter how superior, were tainted with two unpalatable associations. Firstly, they were usually seen as cheap accommodation for the lower classes. Anyone buying one would find themselves living in uncomfortable proximity not only to their neighbours, but also to their domestic help. And, secondly, and perhaps even worse, they were the home of choice for foreigners. But of course, the new developments across London were a great success and Mowll street continues to provide spacious flats in sturdy well designed blocks. 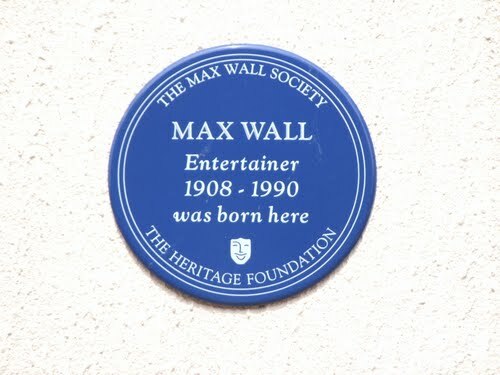 On the side wall of Glenshaw Mansions at the Brixton Road end of Mowll Street is a Heritage Foundation Blue Plaque in honor of the comedian Max Wall who was born at 37 Glenshaw Mansions. Max Wall (12 March 1908–21 May 1990) was the stage name of British comedian Maxwell Lorimer. His performing career covered theatre, films and television. Wall was a son of the successful music-hall entertainer Jack (Jock) Lorimer and his wife Stella. He was born near The Oval, in London. In 1918, during World War I, Wall was saved from death by his cast iron bed-frame, but both his younger brother and their were killed by a bomb from a German Zeppelin that destroyed their house. Wall made his stage début at the age of 14 as an acrobatic dancer in a pantomime, but is best remembered for his ludicrously attired and hilariously strutting Professor Wallofski. This creation notably influenced John Cleese, who has acknowledged Max Wall’s influence on the creation of his own Ministry of Silly Walks sketch for Monty Python. After appearing in many musicals and stage comedies in the 1930s, Wall’s career went into decline, and he was reduced to working in obscure nightclubs. He then joined the RAF during WW2 and served for 3 years until he was invalided out in 1943. He also appeared in Crossroads, Coronation Street and what was then Emmerdale Farm. He also played an ex-con in Minder, with George Cole. In the 1970s and 1980s, Wall occasionally performed a one-man stage show, An Evening with Max Wall, in which he recaptured the humour of old-time music-hall theatre. His last film appearance was in the 12-minute movie A Fear of Silence, a dark tale of a man who drives a stranger to a confession of murder by answering only Yes or No to his questions; those two words, repeated, were his only dialogue. The film won a gold award in the New York Film and TV Festival. I grew up in Morat Street in the 1960s. I was given a different explanation of the origin of the street’s by a woman who had lived in the area since the turn of the century. She maintained that the area was very theatrical and that the street got the name Mowll because of the number of prostitutes who lived there (Mowll or Moll being an old word for prostitute). Unfortunately, your explanation makes much more sense even if it is less colourful. When I lived in the area in 1970s and 1980s (including Crewdson Road and Hackford Road), with friends in Mowll Street, I too heard that a good number of the original tenants were ladies of the night. I also heard about Rev. Mowll. I lived in Mowll Street in the 1990’s and 2000’s. I did not know about Rev. Mowll but a taxi driver, taking me home, said that the street used to be known for “pimps, perverts and prostitutes”. i was brought up in mowll st in the fifties and llived there until 1959 I went to school in Durand gdns infant school then the reay primary then Kensington central all in hackford road. I remember all the prostitutes that lived there.Tten there was Cody’s and Arnold’s and Toys all in south island place.Opposite the Reay school was a bomb site which they built flats on.There was a waste paper merchant merchant called Downes.There was a lot of bomb sites in Caldwell St.The vicar of the church was a Mr Pizzy .We usused to play tin tan tommy in the street. I grew up in Mowll st in the fifties.I rember Downed paper plant.I went to Durand Infants then the Reay followed by Kensington Central all in Hackford Road.Opposite the Reay was a burnt out shop and next to that was a bombsite where the Caldwell estate is now.In south island place there was Cody’s sweet shop.Then there was Arnold’s grocers .The butcher was next door.Up the road was Toys fish and chip shop. I had a friend in Mowll street. Carol Dunlop. She lived in the mansion behind the church. We were in the same class at Reay school. We used to hop the wag and go to the pictures at the Astoria Brixton. We used hide in her front room and sneak out her front door when her mum was busy in the kitchen. Her elder sister opened the Oasis Cafe on Clapham Rd which used to be Week:s Removals. I think she had a daughter and son. Is J M Dunlop related? I lived in mowell street with my grandad until I was 7. He lived at glencoe mansions. We later lived at 31 south island place till approx 1964. I am 67 now. 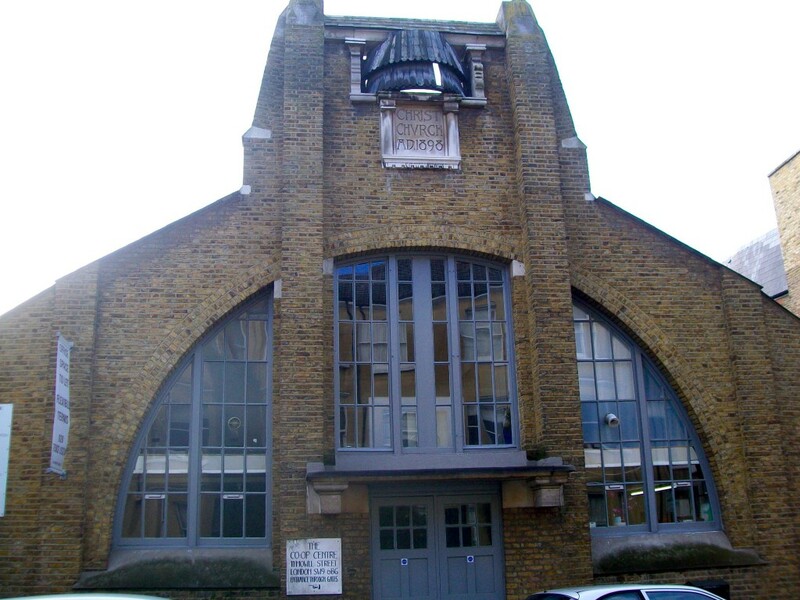 I got married in christ church on the corner of mowell street in 1969. The flats in the ansio s were beautiful. I remember delivering newspapers there when they had the time operated light pushes. In the winter I used to run like mad to get to the top floor and down again before the light went off!!! I lived at 35 Cleveland Gdns from 1945 to 1962 when I moved to Newcastle upon Tyne. I had several friends who lived in Mowll Street and they were Janet Atkinson, Carol Harpin, Linda Symons, and Patsy Hopper. There was also two boys Brian and Norman Hallier whose parents lived in the caretakers house adjoined to the Reay Primary. There were happy times and I also remember Coadys sweet shop but I believe that the block I used to live in was demolished and another more modern block was built in its place.